… That’s how I announce an imminent eruption of Beehive Geyser on the visitor center PA system. Usually, I then proceed to watch out the window while visitors head outside. Beehive is beautiful even from indoors, but there’s always a part of me that longs to go out and enjoy the eruption with the crowd. Yesterday, though, my co-worker Ranger Landis sent me out to watch the geyser and talk about it with the thirty visitors who happened to be in the right place at the right time. He kindly covered the visitor center desk so that I could enjoy the roaring, powerful eruption at close range, standing on the boardwalk just across the Firehole River from Beehive. It was an important reminder to be thankful for generous gestures from friends and strangers—and to be more giving myself. Never doubt that small acts of thoughtfulness and kindness can carry tremendous meaning. 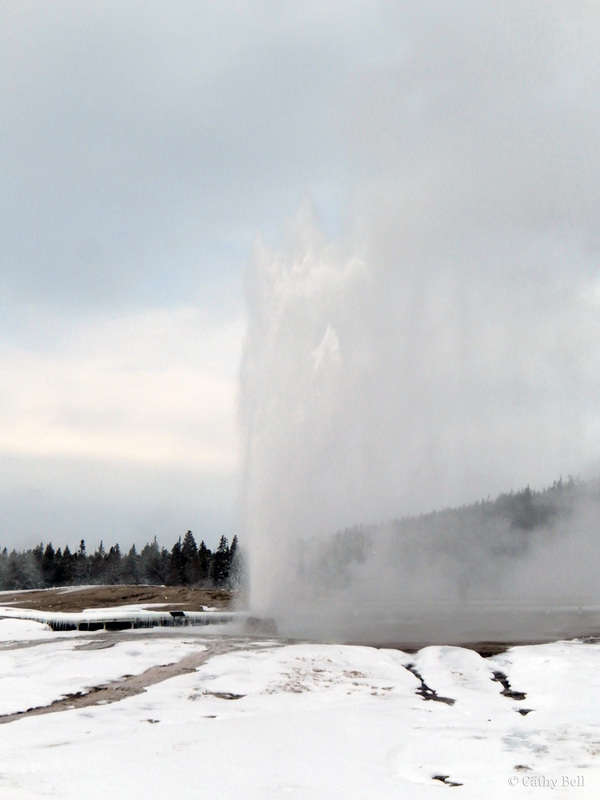 Beehive Geyser erupts on January 10, 2014. Beehive + Winter = something I must definitely see one day! Great images and storytelling, Cathy! awesome. Thanks for sharing your knowledge and insight to help others get out to see Beehive. And thanks for writing these posts. I often imagine myself standing right there beside you enjoying the scene. It’s appreciated from all the way down here.